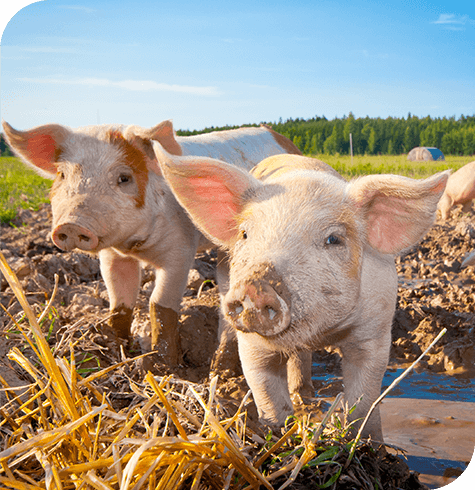 Our large animal team can provide advice on all areas of pig keeping including castration, reproduction and the legal obligations of pig keeping whether a family pet or a production animal. We recommend you choose a breed that suits your situation. Vietnamese pot-bellied pigs are a popular pet breed; they grow to approximately quarter/half size of a commercial pig. Kune Kune pigs are small and short, growing to around 60cm in height; they do not tend to get fat. Micropigs are not a recognised breed, they have been developed through selective breeding. Some micropigs can reach 150kg so please take this into account. Rare breeds such as Gloucester Old Spot and Middle White are well suited to meat production, woodland management and conservation breeding. We have excellent facilities to castrate your pig at the clinic as a day patient. Castration of male pigs can be carried out from 2 weeks of age. Pigs are susceptible to a variety of diseases; please do not hesitate to speak to one of our vets about the vaccines available.